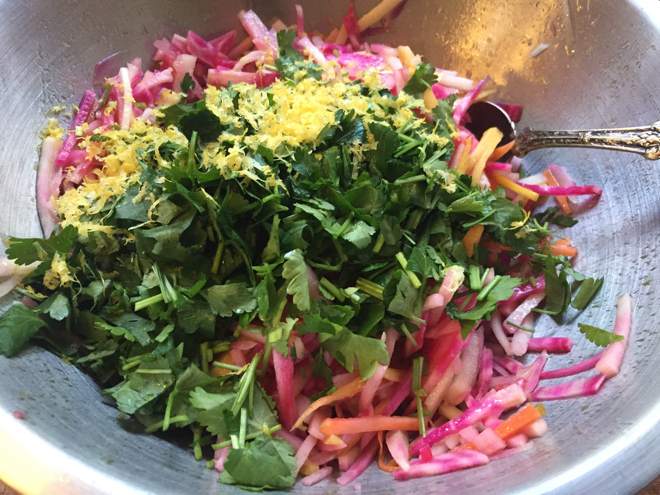 This was my version of this root vegetable slaw from the wonderful book Jerusalem by Yotam Ottolenghi. Getting a cancer diagnosis was scary. It didn’t leave me with much band width to make major life-style changes. Those are hard enough to make when one is well! After the original shock subsided and a plan for treatment formed I began to realize just how lucky I was. I knew how to cook vegetables and had a steady source in the form of my CSA. I already loved vegetables, particularly cruciferous ones like broccoli, cauliflower, collard greens, cabbage and kale, which are noted for their cancer fighting properties. As I proceeded through many months of chemotherapy, followed by major surgery I was able to eat and often prepare for myself great quantities of vegetables. Luckily, all these veggies also tasted good during treatment, especially with plenty of added acidity and spice during the months of altered taste buds. As I near the end of my treatments and regain strength and venture back out into my garden and sign up for my CSA (summer and winter) I am maybe more grateful than ever for farmers and farmworkers near and far. Farmers for whom the hard winters, storms, droughts and increasing climate volatility and fickle consumers and trends are not something managed by weather appropriate clothes or simple tweaks in business plans. The resilience, smarts and commitment farmers demonstrate day after day is staggering really. And the CSA–Community Supported Agriculture–model was designed in part to provide a little bit of stability in this volatile profession, providing $ up front so that farmers can plan for the season’s work and harvests in a way that involves the eater in a bit more depth. CSA is what has made me a better cook over the years and certainly what has inspired the increased quantity of vegetables enjoyed daily. Hopefully most of us will not get cancer and will not think about vegetables primarily as a collection of nutrients with various properties but will enjoy them in all their beauty and deliciousness and cultural relevance and richness. However, it is nice to know that in addition to all that, enjoying them and knowing how to prepare them has many advantages for us and our loved ones, some of whom may need that extra boost today or some day in the future! A special shout out to the CSA farms with whom I work, who subscribe to my Seasonal Recipe Collection so that their members can enjoy their weekly bounty to the fullest, with simple recipes and tips. Now is a great time to sign up and see what the season has in store for you!